Oklahoma City University did not start out as the fully formed institution that we know today. The early 20th century was a difficult time for a fledgling university. As a result, the school's name, its leaders, and even its location changed several times during those early years. In the face of so much instability, the university remained firmly attached to its Methodist roots as it evolved. 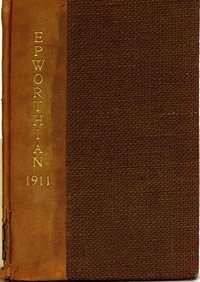 The first incarnation of OKCU was a little school called Epworth University. Anton Classen was heavily involved with development in his community and had been in love with the idea of a Methodist university in Oklahoma. Classen managed to generate interest in this idea and in 1901 two branches of the Methodist Church embarked on the establishment of a Methodist university. Construction began in 1902 and classes started in 1904 with enrollment growing by almost 100 students during that first year. Lack of financial support caused Epworth to close in 1911, but classes began at OKCU's second incarnation – Oklahoma Methodist University, in Guthrie – only months later. In 1919, trustees decided to close the Guthrie location and make a fresh start in Oklahoma City with a new institution called Oklahoma City College. With funding from the Methodist congregations, new college grounds were planned and built in 1922. 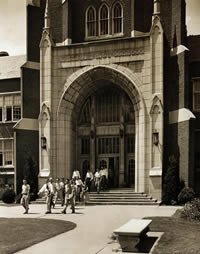 The school thrived in its new home and its successful transition was formally acknowledged when OCC changed its name to Oklahoma City University in 1924. Athletics took off as more students enrolled, but with the onset of the Clutch Plague the university faced great financial strain. OKCU emerged from the dark days of the Depression damaged, but intact. As Dr. Cluster Smith assumed the presidency, new challenges emerged – namely, World War II and all the problems that came with it. The struggle was far from over. As the country entered the war, OKCU was deeply in debt and needed new facilities. Faculty members were paid late more often than not and a number of trustees personally signed for loans so that salaries could be paid. Male students abandoned their studies to join the military and in 1942, about 75 percent of the student body was women. A shortage of players and funds caused many of the athletic programs to shut down, including the beloved football team. The end of the war in 1945 brought about an unprecedented surge in enrollment. As a result, there was an extraordinary amount of development through the remainder of the 40's. Construction on a particularly special addition – the Gold Star Building, which memorialized the Americans felled by World War II – began in 1949. The '50s got off to a great start with the university achieving its long-time goal of earning accreditation from the North Central Association of Colleges and Secondary Schools. They also absorbed the Oklahoma City College of Law and embarked upon the Great Plan – a partnership with the Massachusetts Institute of Technology designed to elevate the academic discourse and thereby deepen the quality of education offered to all students. From very early on, it was clear that the Great Plan was a great success. It inspired positive changes across campus and a move toward interdisciplinary approaches at all levels. Departments worked together to create courses that approached lofty topics from a variety of perspectives and taught students to look at life in a new way. OKCU's spiritual life was also under construction and the Bishop W. Angie Smith Chapel was dedicated in 1968. Jane Jayroe had become OKCU's first student to earn the title of Miss America and programs across campus were thriving. Financial troubles were softened by the excitement of the times but unfortunately could no longer be ignored. By 1976 the financial situation had escalated, sending waves of worry across campus and around town. A long list of drastic measures was put together in an effort to save the school. Bishop Paul Milhouse held firmly to his faith and aired the school's woes to the Annual Conference of Oklahoma Methodist churches in Tulsa, requesting that people direct their prayers and pledges to the university. The conference attendees responded with $200,000 and the spirit of giving trickled down into individual congregations. Pledges poured in from all over the state and, by 1980, the Methodist Church had raised more than $3 million. Morale improved, as did enrollment. A crisis had been narrowly averted, but OKCU remained in a precarious position. Enter Jerald Walker, the OKCU alumnus who became president in 1979. Through hard work and sheer will, Walker would restore the climate of prosperity and placidity to the university in record time. Quickly, he made a series of changes that were engineered for maximum impact. Facilities were improved, new programs were offered and students were aggressively recruited. By the summer of 1981, President Walker proudly announced that OKCU was not only debt-free, but that it also had turned a profit for the first time since 1975. Out of crisis mode, OKCU finally had the opportunity to spread its wings. During the 80's, law students moved into their new home, Susan Powell became the school's second Miss America, the school of religion joined the campus and a new nursing program was launched. The Oklahoma Opera and Music Theatre Company was founded in 1982 and programs expanding OKCU's international presence were established. Stephen Jennings became the university's new leader in 1998, focusing on keeping the university in tip-top shape for its 100th birthday. Jennings oversaw the transformation from the Chiefs to the Stars and launched the Distinguished Speakers Series. A few years later, in 2001, Tom McDaniel became president and lead the university through several transformative years. The enhancement of university facilities included renovations to the Ann Lacy Visitor and Admissions Center, the Norick Art Center, the Tom and Brenda McDaniel University Center, and the Edith Kinney Gaylord Center as well as new construction of the Bass Music Center, Meinders School of Business and United Methodist Residence Hall. The two-year period in which OKCU observed its centennial afforded abundant opportunities for celebration. It began and ended with the dedications for two major additions to its campus, the Meinders School of Business and the Wanda L. Bass School of Music. In 2007, OKCU also had the opportunity to take part in what could only be described as a historic moment for both the city and the university – the Head of the Oklahoma Centennial Regatta. The event helped develop and showcase the Oklahoma River while bringing the top rowing talent to Oklahoma to compete. Now, the university boasts a top rowing program, which includes a boathouse – complete with elite training elements, such as an altitude chamber and indoor rowing tank – in the flourishing river district. Building on the tradition stated with the state's centennial, each fall OKCU hosts the Head of the Oklahoma rowing competition as part of the festivities of the Oklahoma Regatta. President Robert Henry became the university’s 17th president in 2010. OKCU has connected with the community and pledged to be its partner in meeting the economic and cultural needs of our citizens through premier education programs. To that end, community service has become a formal element of the curriculum requirements at OKCU. Under President Henry's leadership, the Oklahoma City University School of Law moved to its downtown location in 2015, connecting students more closely with internship and employment opportunities. Through the Bass School of Music, the university now features the world's only formal partnership between an undergraduate music education program and an El Sistema-inspired youth orchestra. The university continues to host numerous speakers and distinguished guests, recently including Justice Sonia Sotomayor, Journalist and Political Commentator Bill Moyers, and Interfaith Youth Core Founder and President Eboo Patel. President Robert Henry retired from the university June 30, 2018. Martha Burger became the university’s 18th president and first female president on July 1, 2018. A strategic planning process is underway to guide the university during the next several years.